The trigger point end of the TheraPress® 2 is shorter than the original Therapress®. This is excellent for therapists with smaller hands, working on smaller muscle groups and as a companion to the Original Therapress®. 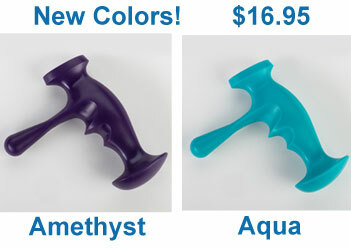 A patented ergonomic massage tool designed to save your hands, apply deep massage and trigger point and acupressure techniques. For wholesale, clinic or bulk pricing call us at 610-834-3992 or fill out the contact-us form.